JOIN THE HUNT to Win One of More Than 200 Prizes! 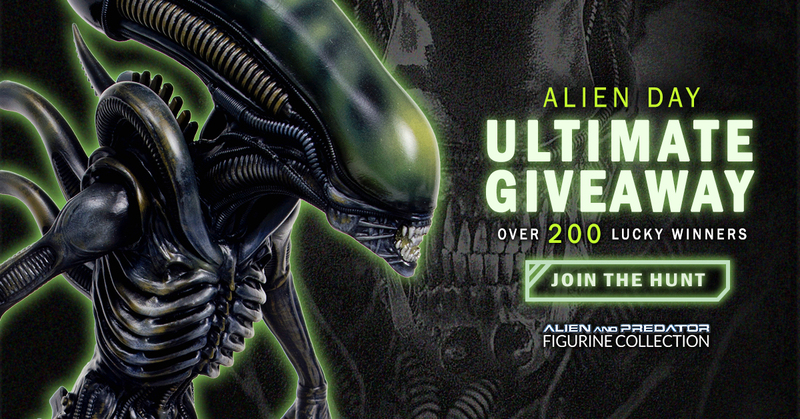 Coinciding with the worldwide celebration of Alien Day on April 26th – commemorating LV-426, the moon of the planet where the Alien saga began – and extending through the premiere of Alien: Covenant on May 19th, this easy-to-enter online sweeps (AlienFigurines.com) will award more than 200 prizes, including five Grand Prizes of an Official Alien & Predator Figurine Collection subscription from Eaglemoss. Ten First Prize winners will receive a premium format “Mega” Alien Xenomorph Statue (standing over 11” tall) from Eaglemoss. Additional prizes include pairs of figures from the Alien & Predator Figurine Collection and officially licensed Alien & Predator T-shirts. As an added bonus, the first 100 fans to sign up for a subscription to the collection will receive a ticket to see Alien: Covenant in theaters. For official rules and to enter, fans are asked to go to AlienFigurines.com. Once there, they can simply provide their name and valid e-mail address and they’re in! No purchase is necessary to enter the Alien Day Ultimate Giveaway. The promotion is meant to drive fan attention to the Official Alien & Predator Figurine Collection, the most extensive range of classic characters and creatures ever assembled from the Alien, Predator, AVP and Prometheus movie franchises. Each figure is presented in realistic detail at 1:16 scale (about 5-1/2 inches tall) and in an iconic pose taken right from the movies. The collection is available by subscription as well as in leading comic shops and pop culture specialty stores.